My grandmother, Louie Webb, used to perform in a glass tank on the West Pier in the 1880s. In 1891 she was presented with this medal by the then Mayor of Brighton, Sir Joseph Ewart. £5 from the Shah of Persia? I would very much like to find out more about my grandmother and her amazing feats. Of course I would also really love to see a photo of her. It has been suggested to me that the Shah of Persia gave her £5 in the 1890s as he enjoyed her performance. If this is true, then there must be photos somewhere. 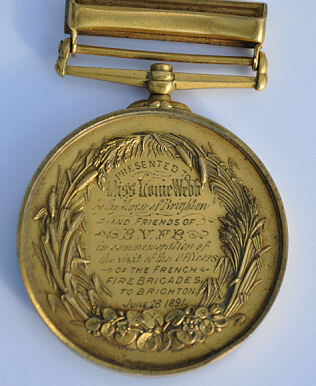 If anyone can suggest where I might find out more about Louie Webb I would be very grateful. Perhaps you could leave a comment below, or reply to Jennifer Drury who will pass on any information to me. 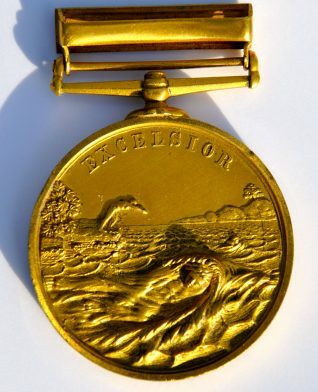 Given that Louie was an aquatic performer, are your family related in any way to George Webb, first man to swim the Channel? No, my late sister checked out Captain Webb. We are not related. Louey Webb was an aquatic entertainer and swimmer who was trained and managed by a well-known swimming instructor named ‘Professor’ Reddish. He was famed for his stunts of diving off Brighton Pier – often on a bicycle! (and he was filmed doing this). Louey was a favourite of Lewis Carroll who spent many summers living in Eastbourne. In his diaries Carrol described Louey as ‘beautifully formed’ and watched her performing four times between mid-July to mid-September 1887. Carroll continued: ‘… went to the pier, and witnessed the performance of Miss Louey Webb. She performs in a tank, like those in the aquarium, with light behind (i.e. glass front and back), and the water just deep enough for her to stand with her head out. She did some sewing, writing on a slate, etc. under water: sometimes being under nearly a minute (she has remained 2 mins 35 secs). Hi Colin. Frances ‘Louey’ Webb is also a great grandmother of mine, through my mum. Would be only too happy to help with your enquiries any way I can. Hi, I am related to Ada Webb, sister of Louie. I have inherited some original documentation from Ada from the late 1800s and I believe there may be a photo in there showing Louie with Ada as part of the the performance troupe. There is a photo or CDV of Louie on eBay at the moment.